First of all Happy New Year. I hope 2016 brings you everything you hope it too, and you don't have much of the things you don't want it to bring! These two scarves were made for Christmas presents for my Mum and sister. 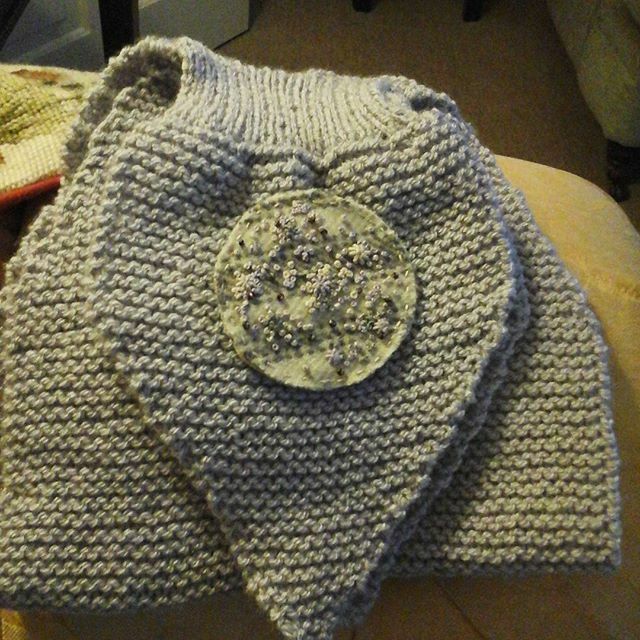 I used Skiff's Miss Marple Vintage Scarf pattern, available for free on Ravelry and I used Stylecraft 4ply acrylic yarn. It's a fairly simple pattern and didn't take me too long to knit both scarves. I made a matching brooch for each scarf using wool fabric that I embroidered with web stitches and french knots and a scattering of beads. Both scarves were appreciated. There's a few more Christmas makes to share with you, but I've already started on my 2016 makes, which I'll also share with you soon. I'm hoping to make myself one (well it's gone on the knitting 'to do' list, when it'll be made is another matter! ).